Usain Bolt holds the championship title belt. His big match with Tyson Gay is yet to come. This weekend is another escalation in the war of performances leading up to the championship of the world. Photo courtesy IAAF World Athletics Club facebook page. Your weekend probably starts on Thursday. Why shouldn’t the track and field weekend begin then too? 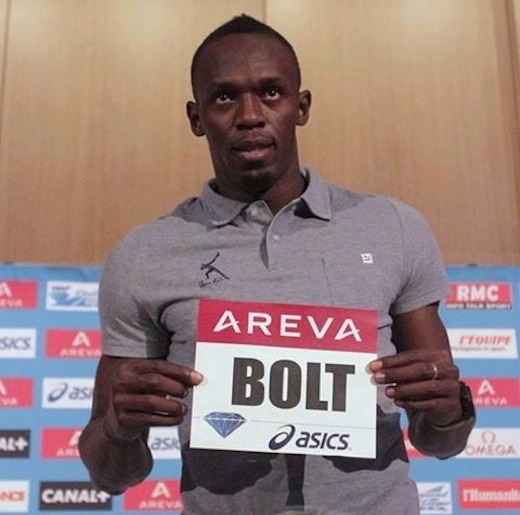 The Diamond League has two big meets in just three days, the Athletissima meet in Lausanne on Thursday and the Meeting Areva in Paris on Saturday. Here’s what to watch for. Don’t misunderstand me when I say this is the weekend’s top matchup. These two are not actually running head-to-head. Rather, the matchup is one of comparison. They are each running against lesser competition, Gay in the 100 at Lausanne and Bolt in the 200 at Paris. The two races will be separated by only two days and 500 km and we will find out something about how the two measure up against each other. Gay should win with ease, while Bolt could get a challenge from Warren Weir. Track fans often bemoan the unwillingness of the sprint stars to race against each other. But these are the two dominant sprinters of the new century, neither of which was at his best in the same season. Now Gay is better than he has been since 2007, back when only track nerds knew who Bolt was. When they finally do meet, it will not be some run-of-the-mill matchup. Think Ali-Frazier or Seabiscuit against War Admiral. So these two races are a kind of performance art. They are meant to be compared and contrasted and used to fuel the argument about Who Is Number One, something that can never really be settled until the Worlds. Last week I chose this as one of the top matchups at the Birmingham Grand Prix and it came through. Taylor won with a season’s best mark but Tamgho got the attention. The Frenchman, a bit rusty after missing nearly two years to injury and surgery, fouled on five of his six attempts and a couple of them were huge. One was in the range of 18 meters, and another even longer than that. The world record of 18.29 meters (60′ ¼”), once thought nearly unapproachable, could be beaten and soon. But if Tamgho is not on the top of his game, Taylor will beat him. If Bolt and Gay are the heavyweight championship title holder and the contender, then this high hurdle race is a nine-man battle royale. There is no clear favorite to win the World Championships this year, but seven of the top eight or so contenders are all racing on Saturday in Paris. There are all four US team members–surprise national champion Ryan Wilson, world record holder Aries Merrit, defending world champion Jason Richardson, David Oliver–plus 2009 world champion Ryan Brathwaite and Olympic bronze medalist Hansle Parchment. Even former world record holder Dayron Robles is here (rumored to be pursuing French nationality) and he is making a bit of a comeback and shouldn’t be overlooked. The makeup of the US team for the World Championships is not yet finalized due to qualifying standards for the Worlds. Four US athletes will be pursuing those standards this weekend. In the steeplechase in Lausanne (Thursday, 2:28pm ET), USATF runner-up Ashley Higginson will try to go under the ‘A’ standard of 9:43.00. 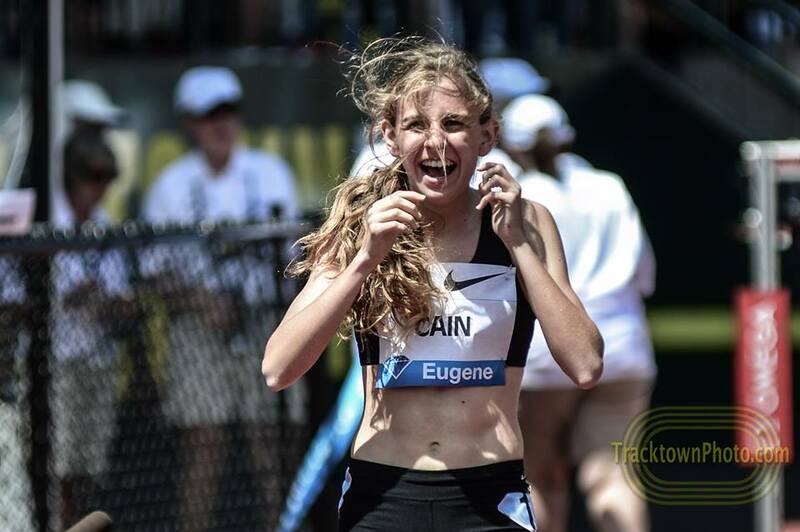 It seems likely, as she’s run that fast before and missed it by less than two seconds at the national championships. She’s already secured a spot on the US team, but if she hits the mark then 3rd-place Shalaya Kipp is also on the US team. In the 1500 meters in Paris (Saturday, 3:40pm ET), all of the top three at the national championships will be pursuing the ‘A’ standard of 3:35.00. Those three are Matthew Centrowitz, Leo Manzano, and Lopez Lomong, and again it appears likely that they will achieve it. 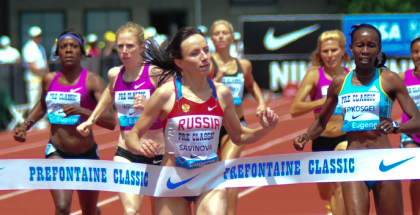 All are injury-free and in good shape and just need the right situation; Lomong and Centrowitz ran the mile equivalent of a sub-3:35 at the Prefontaine Classic. These two are my best guesses as to the contenders for the US title on Thursday, but it’s a good field with most of the nation’s top long-distance runners. 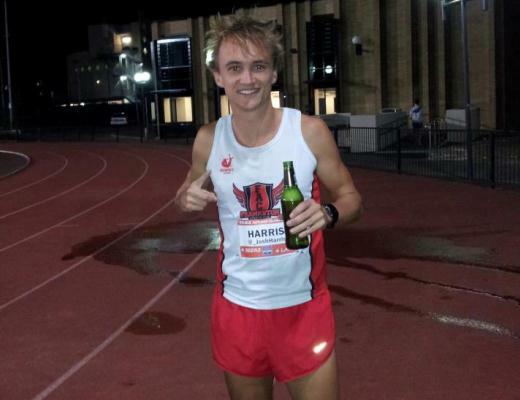 There are top marathoners (Meb Keflezighi, Ryan Hall, Abdi Abdirahman), top roadies (Josephat Boit, Shadrack Biwott), up-and-comers (Bobby Mack, Luke Puskedra) and top club runners (Bobby Curtis, Jacob Riley, Brent Vaughn). The women’s side is not quite as deep but still should be a good race. In the absence of Superman David Rudisha, the world’s top 800 runner has been Mohammed Aman. This is hardly surprising given that he was the only man to beat Rudisha in either of the last two seasons (doing it once each). The man who might be even better is Botswana’s Nijel Amos, who finished second to Rudisha’s stunning Olympic run in a world junior record time–and who was still close to Rudisha at 715 meters. Amos has missed most of the season with a quad injury and this is his first 800 meter race of the year. Healthy or not, it will take more than one race to get into the swing of things. More interesting yet could be the Diamond League debut of Brandon Johnson. The former 400 hurdler (48.59 PR) is in the second year of his transition to the 800 meters and, by 2013 times, is third-fastest in the field. It’s been a fairly sharp improvement curve for Johnson; will it continue? Barrett, the new pro just out of the University of Arizona, was the surprise Olympic silver medalist last year. Chicherova was the Olympic gold medalist and it was a surprise to no one. Now they lead the world list, with Barrett on top and Chicherova second. Barrett has never beaten Chicherova in three tries but is now in her best position to knock off the Russian. Waiting in the wings is Blanka Vlasic, making a nice return to action after a very long layoff due to surgery and infection, and she’s quite capable of beating both Barrett and Chicherova. It hasn’t even been a month since the NCAA Championships concluded and a whole boatload of former collegiate stars will be making their Diamond League debuts as professionals. Besides the above-mentioned Barrett, there is Derek Drouin (Lausanne, high jump), Kimberlyn Duncan (Lausanne 200 meters), Charles Silmon and Isiah Young (Lausanne 200 meters), Georganne Moline (Paris 400 hurdles), and English Gardner (Paris 100 meters). Kirani James is supposed to be the top quarter-miler both now and in the foreseeable future, but LaShawn Merritt beat him at the Prefontaine Classic to even their 2013 series at one win each. They’ll go at each other again in Paris on Saturday at 2:17pm, Eastern time. Amantle Montsho was undefeated in 2013 until Christine Ohuruogu snuck past her right at the finish line last week in Birmingham–Montsho says she didn’t see her–and they’ll face off again in Lausanne on Thursday at 2:03pm, Eastern time. 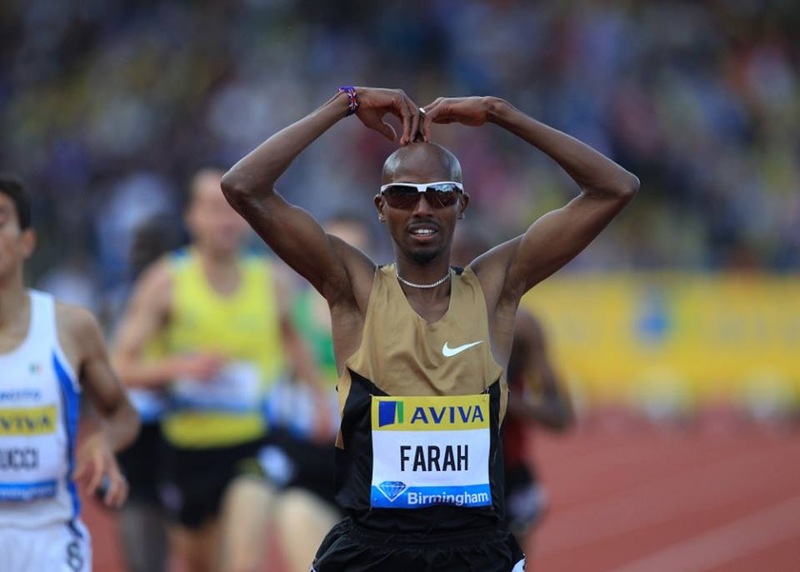 Athletes don’t compete in national team uniforms in Diamond League meets, but fans’ rooting interest is usually centered more around what uniform they’ll be wearing at the Worlds or Olympics. This race is likely to be just that way. Burundian Francine Niyonsaba is the fastest of 2013 with her dominating win at the Prefontaine Classic. Second behind her was Brenda Martinez, who finished second at the US championships and will be on the team for the World championships. The other two US team members in the 800, Alysia Montano and Ajee Wilson, are racing against Niyonsaba in Paris on Saturday. A few years ago the women’s 800 was amongst the weakest events for Team USA, but all three US runners are more than capable of making the finals at the Worlds this year–and once you get to the final in an 800, then anything can happen. Montano has already shown she can run with the best, and now it’s time to see how young Wilson, the 2012 World junior champion, can do in the big leagues. Very informative article, and I look forward to reading more, but just to nitpick I’d like to push the 400m up to #2. It has been several weeks since LsM and Kirani faced off in Eugene, and they’re one and one atop of the Diamond League standings. The Olympic gold medalist was spectator at the U.S qualifiers scoping Merritt’s form and quite hungry after loosing to his elder for the first time in ages if ever. (please correct me in detail if needed). James was thought to be the King of the Quarter for years to come, but now the recovering doper is back with a different plan. Unlike the 100 and 200m sprinters, the 400m men face off more regularly – in keeping with the theme of the article it’s the Intercontinental Championship Belt of the IAAF. It’s nice to see the heavyweights run head to head rather than hear them talk trash into a microphone.